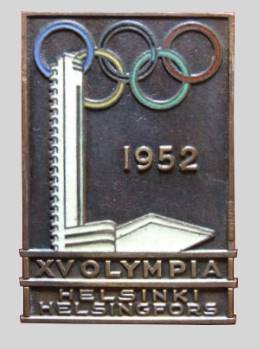 The symbol of the Games, based on the Stadium tower, appeared on the metal badges worn by participants. In the so-called Golden Badge made for the highest dignitaries of the Games and guests of honour the enamel background of the symbol was pale blue; in the silver badges issued to Chefs de Mission, judges, Olympic attaches and leading officials of the Organising Committee the enamel was dark blue. All others wore bronze badges in which only the Olympic rings and Stadium were in colour. The ribbons attached to the badges and their wording revealed the wearer's function. In spite of the 218 different ribbons officials would crop up whom none of the functions mentioned on the ribbons fitted. The badge measured 32 x 48 mm. The numbers made were 300 gold, 2,300 silver and 14,000 bronze.